Democrat Hillary Clinton is running for President. But what do we know about the Clintons, their cash, and their connections? Find out Friday, May 29. Trevor Loudon will share his research on the Clintons and other so-called progressives in our government. As a New Zealander he brings an outsider's view of the nefarious nogoodnik dealings of the Clinton's and their close advisers. From Christchurch New Zealand, Trevor Loudon has been researching the radical left for more than 30 years. Loudon has interviewed many people from both sides of the struggle over the years including former Western intelligence offices, government undercover operatives inside the communist movement, and former KGB officers. This research has given Loudon unique insight into how extensively often miniscule communist parties have been able to manipulate, and even control policy formation in many Western countries – particularly the “main enemy” the United States of America. Loudon’s research shows that this is not just a historical problem, but is a very real issue, threatening America’s national security, and indeed very survival, right up to the present day. Loudon has addressed more than 300 conservative, tea party, religious and Republican groups in more than 30 states including many in Oregon. He believes that if America should fall, so will every Western nation, including his beloved New Zealand. 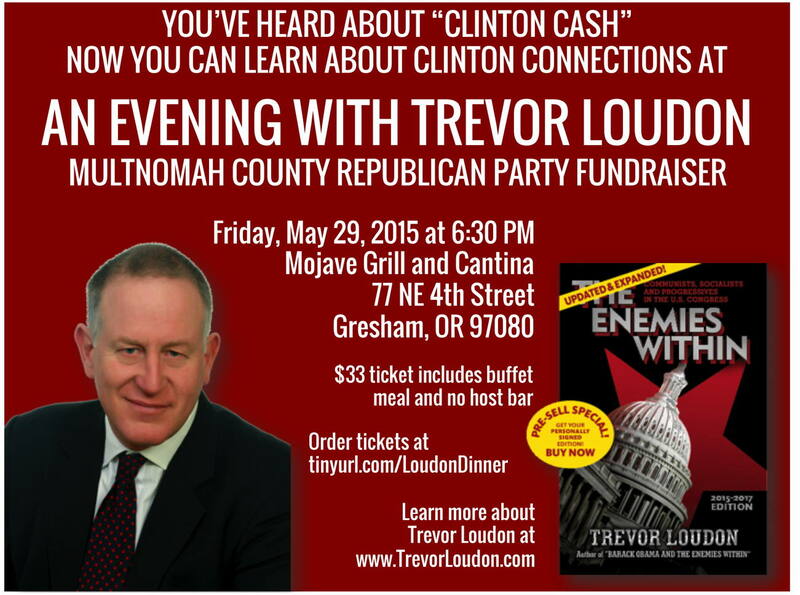 Enjoy a mind-blowing evening with Trevor Loudon over fine Mexican cuisine at Mojave Grill and Cantina in Gresham Friday, May 29 for only $33.00 in a fundraiser for Multnomah County Republican Party. The $33 price includes a buffet meal, gratuity, and a contribution to the Multnomah County Republican Party. Beverages can be purchased separately. Buffet menu includes cheese enchiladas, shredded beef, shredded chicken breast, tortillas, beans, rice, green salad, salsa and chips. The restaurant Mojave Grill and Cantina is located on the corner of NE 4th and NE Roberts which is between Powell and Division in downtown Gresham. A large gravel parking lot is behind it accessed from NE 5th or NE Roberts. The glassed in banquet room is upstairs. There will be a small silent raffle. And we will have an opportunity to buy books written by Trevor Loudon and to get them autographed.